The Green Wave's Drew Hansen gently clears out arival en route to the basket during New Milford High School boys' basketball's 57-38 victory over Oxford, Jan. 4, 2014 in Oxford. There are always forks in the road for every high school sports team. The New Milford High School boys' basketball team may be approaching that crucial juncture in its 2013-14 campaign. Coach Wayne Thrall's Green Wave appeared on track to a strong season when it shut down down host Oxford, 57-38 on Jan. 4 to improve to 3-2 (see photos). However, the NMHS quintet since dropped a Jan. 7 homecourt decision to Bethel, 63-57, and last Friday, Jan. 10, found itself dominated by arch-rival New Fairfield, 70-55, on the Rebels' court. 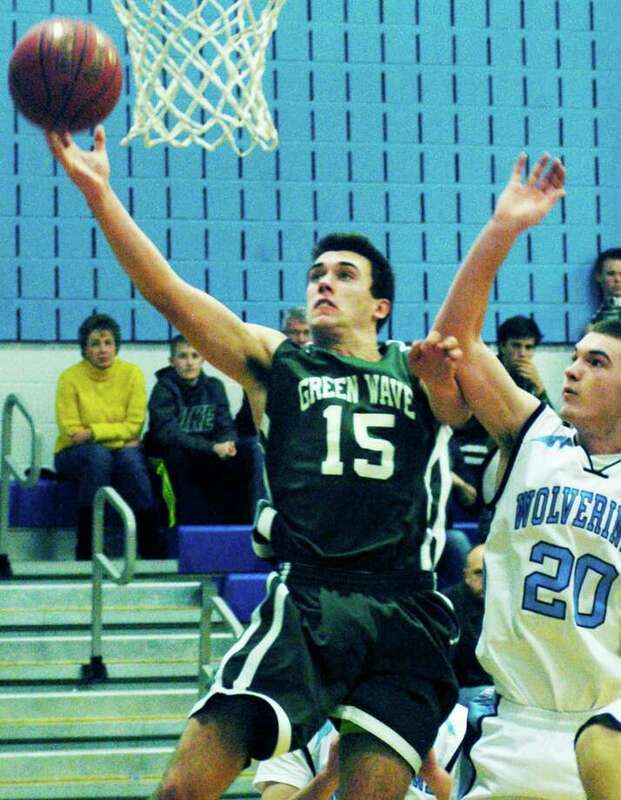 At 3-4 and much in need of a victory, the Green Wave was set Tuesday, Jan. 14, to visit Weston. On tap are a Friday, Jan. 17, home date with Stratford and a Tuesday, Jan. 21, trip to play Immaculate in Danbury. Updated scoring statistics were not available this week but, through five games, senior Joey McKay had led the Green Wave with a 12.8 norm, followed by sophomore Cam Cunningham's 9.0. Senior Drew Hansen was hauling in rebounds at a 6.4 rate to lead NMHS in that department. For more photos, visit www.newmilfordspectrum.com.